The much lauded “peace deal” regarding Syria upon even a cursory examination reveals nothing more than the reiteration of Western demands versus a reassertion of Syrian defiance. The West seeks a “political transition” in addition to fighting the self-proclaimed “Islamic State,” implying that indeed, just as it had sought since 2011 and even beforehand, the West still expects current Syrian President Bashar al-Assad to step down, and a client regime more to the West’s liking installed in his place. And while the West, as part of the “peace deal” claims to seek the end of the Islamic State, it makes no mention of the states sponsoring its existence, which coincidentally includes the West itself. Syria seeks the eradication of all armed groups, even those the West still attempts to claim are not linked to Al Qaeda. It has agreed to elections, confident the Syrian people will return President Assad to power again, just as they did in 2014. Knowing that President Assad would easily win any election held in the future, the West has been adamant about removing him from the process to even the odds in favor of candidates they back, thus undermining the very premise that the uprising had anything to do with “democracy” or heeding the will of the Syrian people in the first place. The “peace deal,” despite optimistic headlines across the West about “unanimous agreement” among nations, is exposed as yet another attempt for the West to reassert its narrative regarding the Syrian conflict upon the global stage. In reality, the “peace deal” is no deal at all. What is left is the same battle that has been waged since 2011, and it is upon the battlefield that Syria’s fate will be truly decided. The West, and the United States in particular, has attempted to take on a more conciliatory tone as of late. And despite actually not really saying so, US Secretary of State John Kerry attempted to impress upon the world that “regime change” was no longer in the cards. Of course, such statements are still followed by US expectations that President Assad will step down. But even as the US strikes this new tone, its regional partners, and more specifically, Turkey, Israel, and Saudi Arabia, have increased provocations against both Syria and Russia in attempts to widen a war that is now winding down in favor of Damascus. 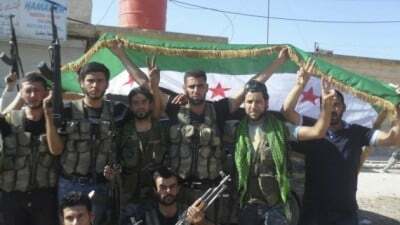 It is clear that the only “peace” that will be had will be when Syria and its allies militarily defeat the West’s proxies on the battlefield and check direct military intervention by the West with an increasing range of military deterrents either sold to the Syrian military, or brought in and operated by Russian forces already on the battlefield. “Peace talks” are aimed only at further buying time and attempting to leverage favorable outcomes before their remaining bargaining chips are swept from the field of battle. In other words, it is yet another distraction laid out to derail Syrian-Russian efforts to restore order to Syria and preserve Syria as a functioning nation-state. For Syria and its allies, remaining focused is the key to truly ending the conflict. The United States has already proven infinitely treacherous. It was under the cover of feigned rapprochement by the US with Syria that the 2011 conflict was prepared and launched. It was under the guise of feigned cooperation in Syria’s airspace with Russia that the US aided and abetted Turkey in the ambush and downing of one of Russia’s warplanes. It stands to reason any “peace deal” not reached by physical force and political leverage being entirely in Syria and Russia’s favor, will likewise be betrayed. Syria and Russia must maintain the appearance of being “diplomatic,” but must also remain entirely realist about the enemy they are fighting, and the true motivations, intentions, and future ambitions that drove this conflict in the first place. Peace was never part of the West’s plan, and so peace cannot be part of Syria and its allies’ solution.